Filth, filth, filth. Late seventies NWOBHM ruffians Tank may have recorded a song and album named Filth Hounds Of Hades, but, lemme tell you that title should really go to Liverpool’s most disgusting doom-merchants Coltsblood and Crypt Lurker, the mucky, mucky pups. Part of the wave of heavier-than-the-stolen-lead-off-a-church-roof doom metal bands currently crawling their way out of the Mersey, both plant themselves squarely in the darker end of doom than fellow Scousers Conan and Black Magician, with Coltsblood stinking of Autopsy-fied deathly dirge and Nightstick brutal psychedelia, and Crypt Lurker welding the cavernous, echoing vocals of black metal to the power-sludge droning doom of Burning Witch. For this split cassette release – lest ye forget that, like Hansel, cassettes are so hot right now – each band takes a side and delivers one slab-like fetid original and one unutterably rancid cover, with Coltsblood plumping for, naturellement, ‘Procreation Of The Wicked’ by the mighty Celtic Frost and Crypt Lurker paying homage to Finnish black metal savages Beherit, with ‘The Gate Of Nanna’ from their Drawing Down The Moon opus. The most immediate thing about Coltsblood is the sheer monolithic force that they generate – they are very much a power trio. Bassist/vocalist John and drummer and suspected cro-magnon man Steve make for such a formidable wall of brutally battered percussion, stomach-churning bass and guttural phlegm-drenched grunting that it really wouldn’t matter what guitarist Jem played on top of it – she could pull a John McGeoch and give her interpretation of Swan Lake and it would still be gut-wrenching. As it is, Jem’s contribution is a wonderfully lysergic mix of fizzing, acidic distortion and tripped-out delayed atmospheric leads which really acts as the icing on top of the urinal cake. Their own track, the nine-minute plus ‘Consumption’ starts with a clanking, malevolent bassline that is quickly battered thoroughly into submission by the brutal-yet-perfectly-measured percussive clatter of Steve, the hissing fizz of Jem’s distorted guitar and the buried slurring roar of John’s vocal. The track lurches between ultra-doomed virulent sludge and a relentlessly rolling propulsive swing, driven by Steve’s brutal drum-pedal beating and Moon-on-elephant-tranqulisers fills and shot through with Jem’s whacked-out torturous psych scrambling. Their cover has them put their own depraved spin on the Frost classic, dragging the tempo and increasing the barbarism, leading to a slurred avalanche swathed in crackling fizz, drums that sound as though they are fighting free of a sucking tarpit and a vocal delivery that sounds uncannily like Tom G Warrior with vocal cord nodules. A thoroughly brutal and very dirty protest. Whilst not quite as disgusting on the ears, Crypt Lurker are no slouches in the dirt department either, with their track ‘Behold! A Black Pestilence Dwells In This Cyclopean Tomb’ quickly swelling from high-pitched droning feedback into thick, ugly blown-out lumbering sludge with all needles firmly buried in the red, malevolently topped off with the cave-dwelling croak of frontman J.C.H. The quintet conjure a totally bleak, dank and morbid atmosphere with ease, the guitars of K.Dl and M.H scraping against one another like the lids of sarcophagi and bringing down monstrous chords that thunder like the hammer blows to a coffin lid as it is firmly nailed shut. 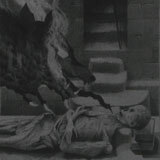 The oppressively morbid air is, naturally, carried through to the barbaric cover of Beherit’s ‘The Gate Of Nanna’ that closes their side of the cassette, with the drums all but disappearing into hissing static under the weight of the colossal guitars once the speed picks up above lumbering speed. Despite the lo-fi recording, there is absolutely no loss of power, unlike with much straight black metal, and the guitars rip through the air like the roaring of monstrous beasts. With both bands just back off a short tour together and both having debut EP’s recently released by new Liverpool label Ulthar Records, it’s clear that the world is very much Coltsblood and Crypt Lurker‘s collective oyster and it’s not hard to predict that very great things are in the offing for all concerned. With Conan and Black Magician leading the way and Coltsblood and Crypt Lurker hot on their heels, Liverpool is now firmly on the map for utterly doomed sounds. Let’s hope they don’t damage the historical architecture eh?